While our home is meatless five days a week, it’s rare for me to cook with lamb, so when I do, it’s a special occasion. Last Friday Night, I made lamb. This, however, was no ordinary lamb. This was a grass fed, 100% organic lamb roast from KOL Foods. One of the many reasons we have cut meat from our diet so drastically over the last few years is concern for the hormone levels found in meat product and the effects of raising animals in confinement. This hormone free and grass fed meat eliminates these worries. You can truly taste the difference in the quality of the meat. Grass fed animals have eaten nothing but their mother’s milk and fresh grass from the time they were born. The organic certification means the meat is hormone free, and the ethical mindset of KOL Foods means the meat has been raised with the freedom to roam. 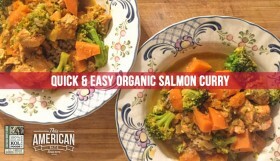 As well as offering the kosher community a healthier alternative to beef, lamb and poultry, KOL Foods have bundled dinner kits that include 4-5lbs beef, lamb or duck; 1 quart of broth and a 1lb kishke. My order arrived from the East Coast to Kansas frozen solid thanks to the excellent packing, and the styrofoam box is an awesome bonus for tailgating or picnics! KOL Foods have the vision of creating an honest, transparent food system that treats animals humanely and they have applied this vision across their organization to reduce their carbon footprint and to sell a product that is not laced with hormones. Their vision is an excellent philosophy to embrace, especially if you don’t want to move towards a meatless diet. 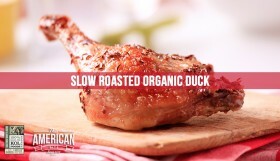 This is the answer to those looking to become more ethically conscious and healthier when eating meat. For those of you less interested in the organic or environmental benefits of this approach to food, you can really taste the difference. There’s a tenderness and richness in the flavor that I have never tasted in lamb. 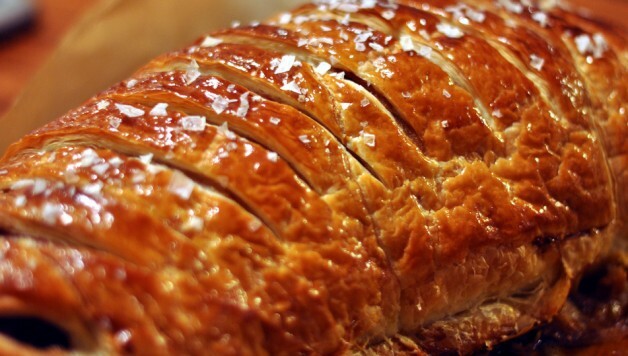 The lamb wellington recipe below offers a great flavor profile and method for keeping the lamb moist while it cooks, and don’t forget to enter the giveaway after this post for your chance to win lamb from KOL Foods. Lamb Wellington or Filet d’Agneau En Croûte doesn’t seem to be a well known dish. 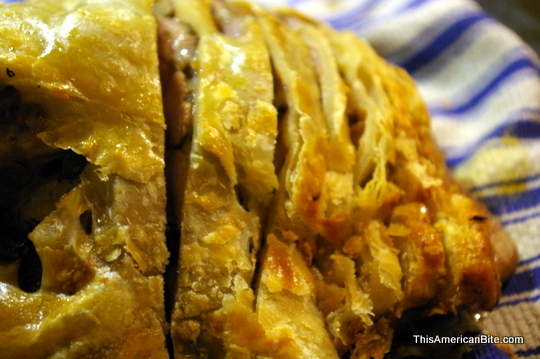 I found myself adapting beef wellington recipes, tweaking the flavors to compliment the lamb. 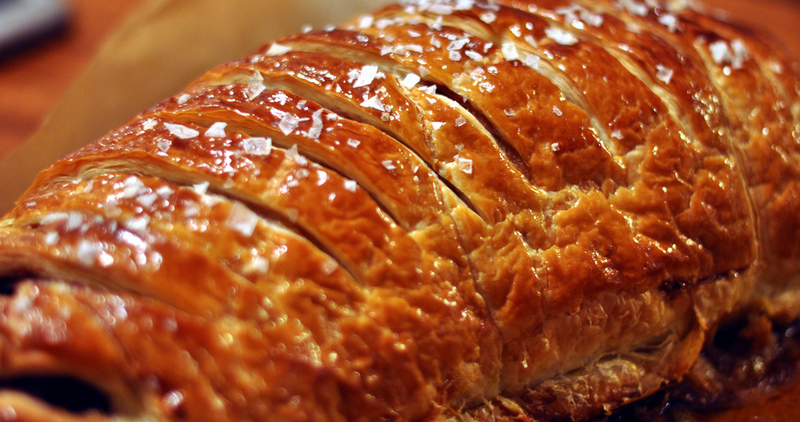 The result is now a tried and true lamb wellington recipe that it’s a pleasure to share with you. The end result was delicious and the seven people around the table on Friday Night agreed! You will need the following ingredients. 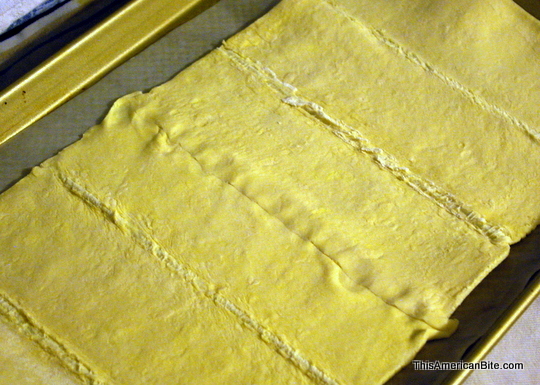 Begin by removing a sheet of puff pastry from the freezer and setting aside so it can begin to defrost. This may take up to 45 minutes, depending on how warm your kitchen is. Don’t rush the process of defrosting the puff pastry, if you force the pastry when you roll it around the lamb later on, it will crack. Put a large skillet on a medium light and drizzle a little extra virgin olive oil so it can start to warm. Peel (or wash the outside) of the mushrooms and roughly chop them, then put into the skillet for about ten minutes until they start to sweat. Measure 1 teaspoon each of salt and pepper and two teaspoons of thyme and garlic powder. Stir in to your mushrooms, then add 3 tablespoons of tamari sauce to the skillet. Stir, then allow the mushrooms to cook until the liquid starts to bubble. 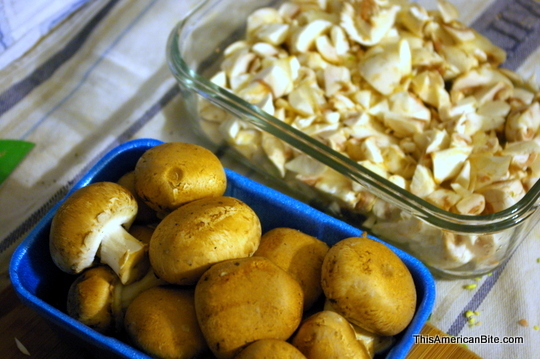 Slowly add two tablespoons of corn starch to the mushrooms and stir until it thickens slightly, then remove from the heat and allow the mushroom mixture to cool. Line a cookie sheet with wax paper and lay the defrosted puff pastry on it. If there are any cracks in the pastry, smooth them with your thumb. Once the mushrooms have cooled, spoon a generous layer roughly the same size as your lamb roast on to the middle of the pastry. It’s important you wait for the mushrooms to cool before putting them on the pastry. Set your lamb on top of the mushrooms then spoon the remaining mushrooms over the lamb roast. 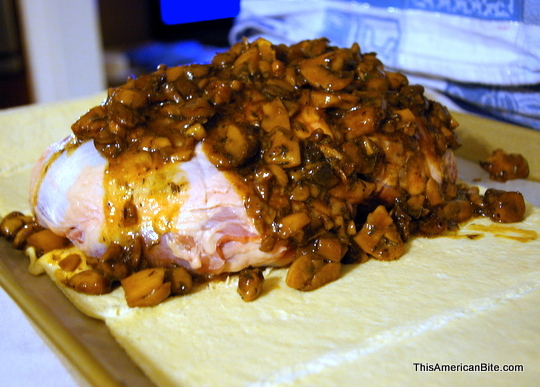 Wrap the puff pastry around the lamb like it is a blanket. Seal the ends with any leftover pastry and brush with an egg wash. Pierce holes though the top of the pastry to allow steam to escape during the cooking process otherwise the lamb wellington doesn’t burst open at the seams. Set the lamb wellington in the fridge for 30 minutes so it can cool and all the ingredients are of a uniform temperature. Pre-heat the oven to 350 degrees and cook until the internal temperature of the lamb reaches 140 degrees Fahrenheit. I’ve said this many times before. Use a meat thermometer. Lamb usually cooks at about 30 minutes per pound, so a three pound roast could take up to 90 minutes – but please, please, PLEASE trust the read on the thermometer (see the one I use in my store). You don’t want to overcook this dish! When the meat is done, remove it from the oven and allow for it to rest for at least 8-10 minutes. If you are not serving it right away, allow it to cool completely before you slice it, and use an electric knife to make sure the slices do not crumble. No one touched any of the condiments that were on the table because this dish needed no compliment, it’s perfect the way it is. The flavor from the mushrooms and the thyme created the perfect bite of tender and delicious grass fed lamb. The pastry kept the entire dish moist even when it was re-heated on a hot plate for Friday night dinner, and when all was said and done, there wasn’t a slice of lamb wellington left! I used the lamb broth sent to me by KOL Foods to make make a batch of my grilled lamb polenta and served this with roasted veggies. Now it’s your chance to make this dish. 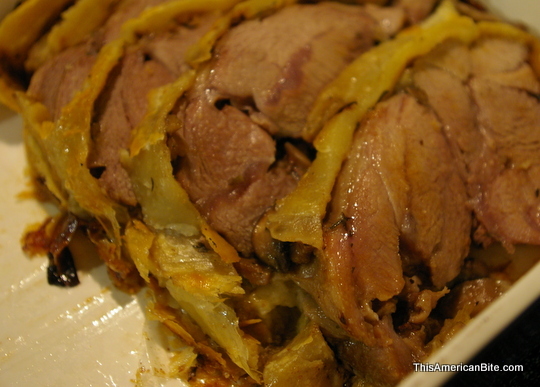 I am giving away some lamb with thanks to the awesome KOL Foods team… and don’t forget that I have been nominated for a Joy of Kosher Best of Kosher award, please visit JOK to vote for This American Bite.